The Dennis and Phillip Ratner Museum is a quirky little place in Bethesda, founded "to foster love of the Bible through the graphic arts" as "a walk through the Hebrew Bible via visual arts." (The irony of the museum's mission in light of the traditional Jewish interpretation of the second commandment is apparently not an issue.) The museum's collection is dominated by the work of Philip Ratner and is supported by the money of the Hair Cuttery fortune. However, I was there last night not to look at art but to listen to a concert by Washington Musica Viva, the unusual performing group that former NIH grant reviewer Carl Banner founded with his wife in 1998. 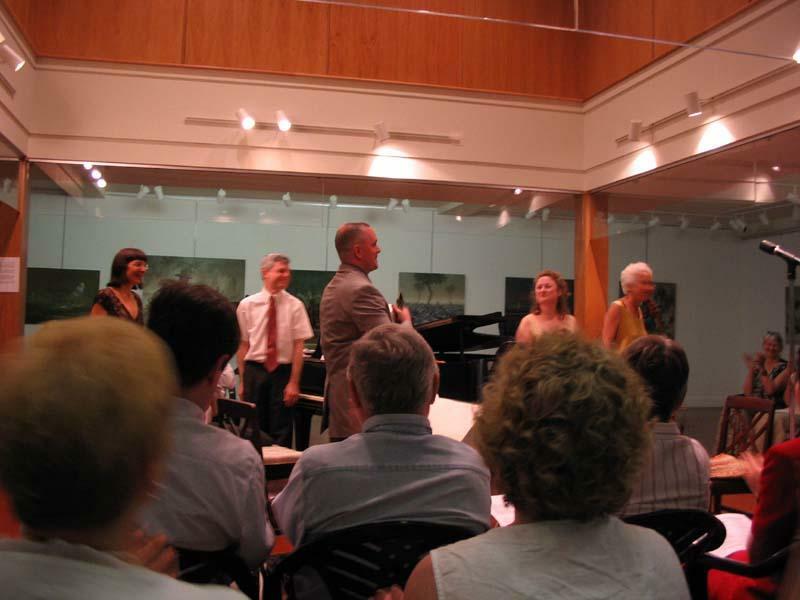 They perform regularly at Marilyn Banner's studio in Kensington and, as it turns out, at the Ratner Museum. They were joined by soprano Elizabeth Kluegel for Janet Peachey's song cycle, Views through a Window, on four poems by former Washington poet Beth Joselow. The composer herself explained that she created this cycle, also an older piece composed about 15 years ago, in response to a soprano's request for a song cycle about a woman's life. Peachey, who also teaches music at the Duke Ellington School of the Arts, chose the four poems from many of Joselow's works she read to make the cycle. They are not about the same woman, but they do tell a story about the lives of modern women that holds your interest. Peachey's musical setting is whimsical, underscoring the humor in Joselow's poetry with at times a jazzy harmonic freeness. The two solo instruments play off one another and the singer by trading lines and gestures, commenting with the piano on the narrator's state of mind. The menacing flutter-tonguing in the clarinet, in particular, evoked the buzz of anger in the second song, "August Routine." Of the three contemporary pieces on the program, this was at once most challenging musically and most likely to hold your attention for more than one listening. Reviewing is dangerous when you are listening to composers who are still alive. The dead ones don't complain as much when you write something critical. I often wonder if it is even worthwhile to write anything about new pieces, since it is impossible to know right now what music is going to have any staying power in the years to come. (Just ask the people who reviewed Beethoven's Ninth Symphony.) In 100 years, will anyone think about these three pieces the way we think about the final work on the program, the gorgeous Trio in A Minor, op. 114, by Johannes Brahms? I don't know, but it was a great idea to feature two new works for the same combination, and it got me thinking about just how wide a range of sounds composers can coax from those instruments. Mr. Redwine's soaring, commanding lines were transparently backed by Mr. Banner's piano, something that is not easy to achieve, given the way that Brahms wrote his piano parts. It was a fine concert, with new music paired with old. You can find out more about the group and its performance schedule at their Web site.